The size of today’s life is limited by gravity. A reduced gravity would lessen the weight of life and enable the relative scale of all life to become larger. It is a theory that applies to all life over hundreds of millions of years. All land based life would be shifted towards a larger scale in a reduced gravity. Today, there is a whole range of life of a similar scale. Among the grazers there are wildebeest, rhinoceros, elephants, deer and carnivores like lion and tigers. During the dinosaurs’ time a totally different scale emerges. There were sauropod dinosaurs such as Brachiosaurus several times the mass of the largest elephant, with long necks and tails. The largest meat-eating dinosaurs included the elephant sized Allosaurus and Tyrannosaurus rex. These animals were typical for their age and if the whole cross-section of dinosaurs’ life is compared with today’s life then the increased scale of ancient life is clear. This larger scale of life during the dinosaurs’ time can be explained by a reduced gravity on the ancient Earth. Using the concept of a gravity that increased since the dinosaurs’ time also reveals a fascinating new world where the gigantic animals of the past evolved smaller sizes as gravity increased to its present value. This size reduction of life has definitely occurred. After the dinosaurs became extinct, a range of super-giant mammals reached the size of the smaller dinosaurs. Millions of years later, giant versions of today’s life evolved which have now died out to leave the smaller present-day descendents we see today. 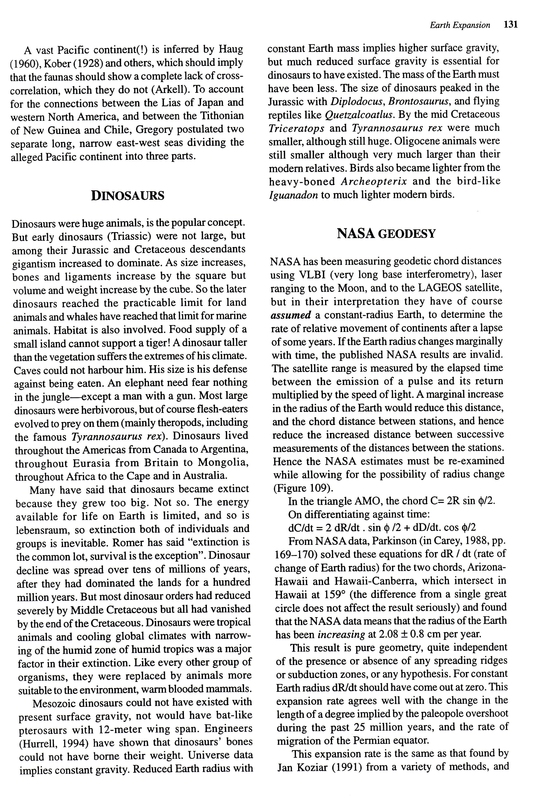 I first published a detailed description of the Reduced Gravity Earth in my book Dinosaurs and the Expanding Earth in 1994. This first edition became increasingly popular as the concept became more widely known and has recently been updated with a third edition in 2011. The Reduced Gravity Earth appeared to be an original concept when I first outlined it in my book, since I was unable to find any books or scientific papers suggesting a Reduced Gravity Earth had been proposed before (there was no Internet then). Dinosaurs' Gravity has implications for the Expanding Earth theory, but publications available at that time also seemed to miss this very important point about gravity and its affect on life. Today there are numerous people discussing, supporting and advocating a Reduced Gravity Earth to explain the gigantic size of ancient life on an Expanding Earth. There have been some notable supporters for the concept; Professor S. Warren Carey was sufficiency impressed by the Reduced Gravity Earth theory to include a section about dinosaurs in his own book, Earth Universe Cosmos, after he had read my book. The Australian geologist, Dr James Maxlow was also convinced by the concept and included a section about dinosaurs in reduced gravity in his book Terra Non Firma Earth. Today the concept of an ancient reduced gravity has been highlighted in a number of publications. Many people continue to promote the concept on web sites and Internet discussion groups and Neal Adams has discussed the idea of a reduced gravity on several American radio programs. This is all good news for the future development of the Reduced Gravity Earth theory. 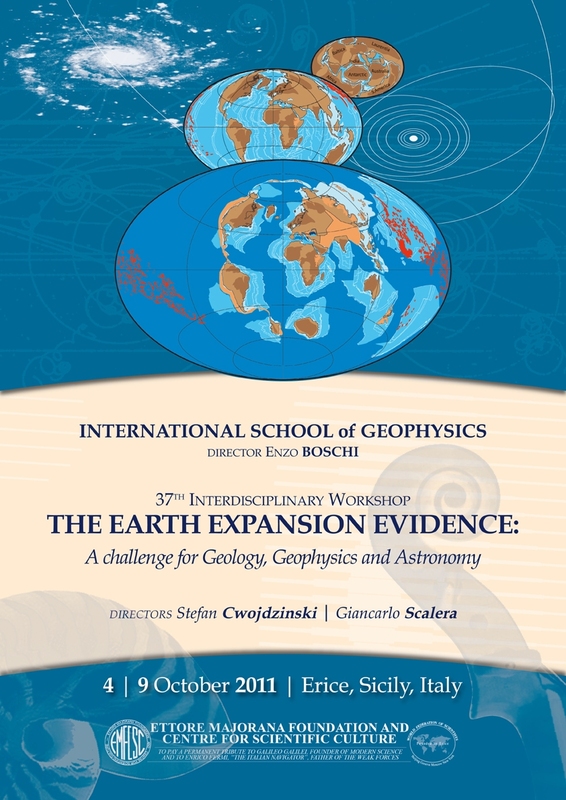 A talk about “Ancient Life’s Gravity and its Implications for the Expanding Earth” presented at the Erice workshop.